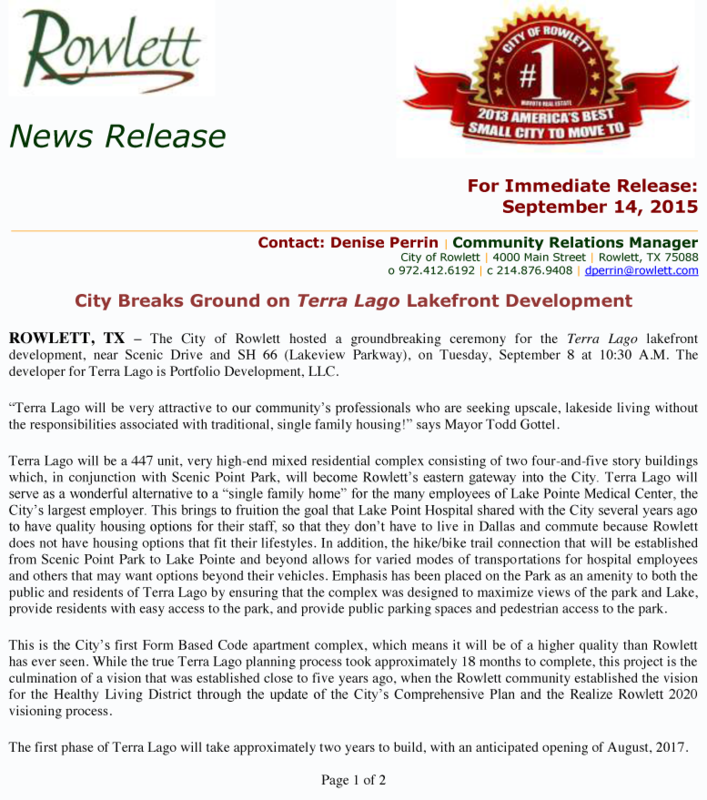 ROWLETT, TX – The City of Rowlett hosted a groundbreaking ceremony for the Terra Lago lakefront development, near Scenic Drive and SH 66 (Lakeview Parkway), on Tuesday, September 8 at 10:30 A.M. The developer for Terra Lago is Portfolio Development, LLC. “Terra Lago will be very attractive to our community’s professionals who are seeking upscale, lakeside living without the responsibilities associated with traditional, single family housing!” says Mayor Todd Gottel. Terra Lago will be a 447 unit, very high-end mixed residential complex consisting of two four-and-five story buildings which, in conjunction with Scenic Point Park, will become Rowlett’s eastern gateway into the City. Terra Lago will serve as a wonderful alternative to a “single family home” for the many employees of Lake Pointe Medical Center, the City’s largest employer. 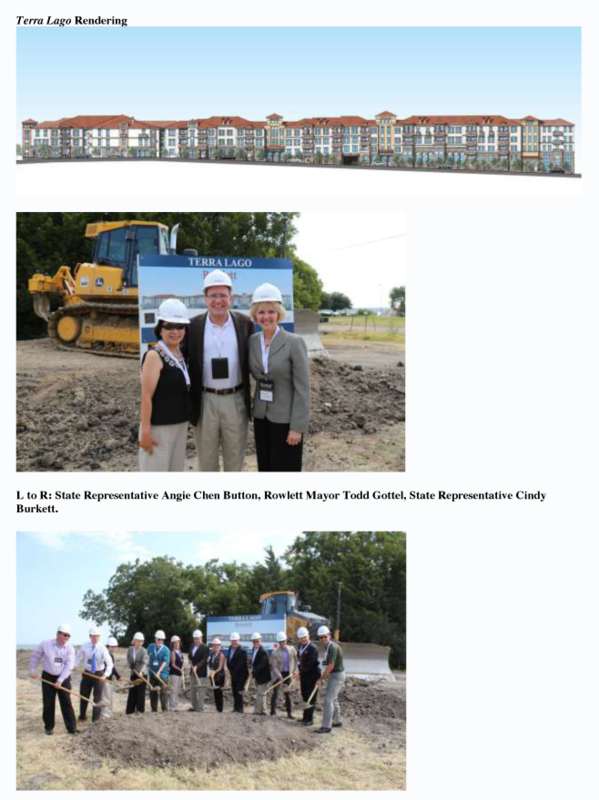 This brings to fruition the goal that Lake Point Hospital shared with the City several years ago to have quality housing options for their staff, so that they don’t have to live in Dallas and commute because Rowlett does not have housing options that fit their lifestyles. In addition, the hike/bike trail connection that will be established from Scenic Point Park to Lake Pointe and beyond allows for varied modes of transportations for hospital employees and others that may want options beyond their vehicles. Emphasis has been placed on the Park as an amenity to both the public and residents of Terra Lago by ensuring that the complex was designed to maximize views of the park and Lake, provide residents with easy access to the park, and provide public parking spaces and pedestrian access to the park. This is the City’s first Form Based Code apartment complex, which means it will be of a higher quality than Rowlett has ever seen. While the true Terra Lago planning process took approximately 18 months to complete, this project is the culmination of a vision that was established close to five years ago, when the Rowlett community established the vision for the Healthy Living District through the update of the City’s Comprehensive Plan and the Realize Rowlett 2020 visioning process. The first phase of Terra Lago will take approximately two years to build, with an anticipated opening of August, 2017.